Rep. Chris Herrod says the U.S. is moving toward socialism. Tribune File Photo Rep. Christopher Herrod, R-Provo, is launching a U.S. Senate campaign challenging Sen. Orrin Hatch for the Republican nomination. He will not resign his legislative seat, saying he has bills that he wants to pass during the upcoming session. State Rep. Chris Herrod, a strident opponent of illegal immigration, announced his bid Friday to unseat U.S. Sen. Orrin Hatch, saying he aims to roll back the socialist federal government. "I absolutely hate the direction we're heading. I hate socialism," said Herrod, R-Provo. Herrod recounted a semester he spent in the former Communist countries in Eastern Europe and said he "could literally feel the oppression" in those nations. He met his wife on a later trip to the Soviet Union. "I'm starting to feel that anxiety [again]," Herrod said. "We're kind of living in the 'Emperor-has-no-clothes.' … Everyone knows theres's something the matter but nobody dares to say anything about it." "I truly believe this nation is at a precipice, at a critical juncture and we have one or two election cycles left to be able to change this nation," Herrod said. He cited the federal health care reform, the Children's Health Insurance Program, Medicaid, the Department of Education, federal subsidies for certain energy technologies and government ownership of banks and auto companies as evidence of American socialism. Herrod joins former state Sen. Dan Liljenquist, R-Bountiful, who announced his candidacy earlier this week, and talk radio host Tim Aalders in seeking to unseat the six-term incumbent Hatch. "If I was Senator Hatch, I would be a little bit discouraged now that there is a second serious contender out there, but in the final analysis, I've got to believe that Senator Hatch has got to be the favorite to win re-nomination," said Michael Lyons, a political science professor at Utah State University. Lyons said 2012 should be a slightly better year for incumbents than 2010 as anger over the Wall Street bailouts has faded and the energy behind the tea party movement waned. "You could say that Senator Hatch is an icon and it's actually frightening to jump into an election against somebody of that stature. But I do have a different emphasis and I feel a sense of urgency," Herrod said. "I would hope people would be willing to vote for me because of who I am. Not a vote against Senator Hatch." 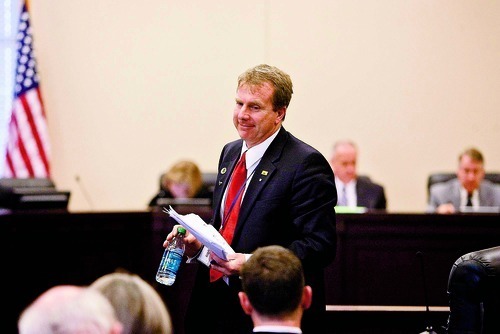 Herrod is a co-founder of the Patrick Henry Caucus and is among the Utah Legislature's most conservative members. He was a leading opponent of immigration laws the Legislature passed that would allow the state to extend a guest worker card to undocumented immigrants. He also co-sponsored legislation with Rep. Ken Sumsion, R-American Fork, to declare eminent domain on federal land. Sumsion is now running for governor. Herrod said it is crucial that Utah open public lands for development, both to bolster the nation's energy independence as well as to bring in money to fund Utah schools. Hatch's campaign manager, Dave Hansen, said the senator welcomes Herrod to the race and anticipates a productive dialogue. "We are confident that Utahns will see their opportunity to have a direct influence on solving some of the most critical fiscal issues of our time and choose to reelect Senator Hatch," Hansen said. Internet businessman Pete Ashdown, who lost to Hatch in 2006, is the only Democrat to have declared his candidacy. Unlike Liljenquist, Herrod will remain in the Legislature because, he said, he is sponsoring legislation in the 2012 session that he believes is vital. That will limit his ability to raise money, he said, since legislators aren't allowed to fundraise during the 45-day legislative session, beginning Jan. 23. "It's going to have to be a grassroots race," he said. He will campaign on evenings and weekends during the session and the six weeks from the time the session ends until the state Republican convention in April.